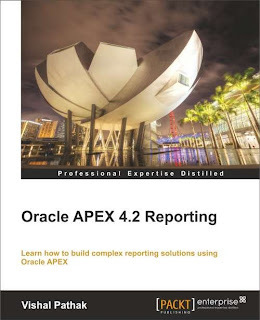 Although the book primarily projects Oracle APEX as a reporting solution, it also speaks about the integration of APEX with a number of other technologies such as Apache FOP, Apache Cocoon, PL_PDF, PL_FPDF, iReports & Jasper, Eclipse BIRT, BI Publisher 11G, Oracle Business Intelligence 11G, BPEL, Oracle forms, Google API and Oracle R Enterprise. The the text of the book is coupled with an APEX application with every chapter. The application of every chapter contains code to give you a live demo of the subjects discussed in the chapter. This chapter lays the foundation of understanding the tool. A deep understanding of this chapter is vital to know the framework of APEX. This chapter talks about the anatomy of APEX and enables the reader to set up an environment. What is really new in the new avatar of APEX? This chapter is dedicated to ethnic reporting. The reports introduced in this chapter exist as an out of the box feature of most reporting technologies. The chapter presents ways and means to implement these known reporting requirements in APEX. Love to talk? Here are interactive reports for you. These reports are exclusive to APEX. These reports let a user do a lot more with a report. The possible tasks include highlighting, filtering, coloring, selecting columns, creating aggregates etc. These reports are to a client what a box of crayons and a drawing book are to a child. This chapter brings a different flavor to reporting and the clients love this flavor. This chapter deals with images and all kinds of animations along with advanced reporting features. This chapter helps you engineer secret drilldown tunnels and magical mystical paths. This chapter is really the difference between an average reporting experience and a user friendly, visually soothing, sensually appealing, smooth reporting experience. This chapter opens a new dimension to conventional reporting. This chapter presents advanced reporting methods and also shows the use the newest features of APEX 4.2 to standardize report developments. The world can exist without these but then merely existing is not fun. This chapter introduces us to an array of technologies which can be used with APEX. These technologies include PL/PDF, PL_FPDF, Eclipse BIRT and Jasper Reports. BI Publisher has been the most popular reporting engine and is integrated with most enterprise solutions. It has been everybody’s sweetheart because people do not have to shell out a lot of cash for it. It gives pretty reports, development environment (MS word can be used for creating templates) is familiar and Oracle is coupling it with everything else in the oracle world. OBIEE, on the other hand, is the grand old lady of BI world. It has been facilitating business examination from the beginning of modern analytic culture. This chapter presents the use of both these technologies, shows the requirement which can be easily implemented in these technologies and also talks about the integration of these technologies with APEX. I adore this workshop. Here we combine the best of every tool to make an unbeatable machine. Some of the highlights of this chapter include BPEL implementations with Human workflows and their use in APEX, integration with technologies such as Oracle R & Google API, understanding various ways to create web services in APEX and converting Oracle forms to APEX. Please share your thoughts on this ..
Is your book available in India ??? Very comprehensive list! Looking forward to reading it when it comes out. Did I missed something but I didn't find how to pass parameters to Jasper Reports with proper security...I mean no way for URL tampering or any kind of modifications to sent parameters to Jasper. Hope I'll get an answer .. The following syntax can be used to pass arguements to restful webservice. Apart from RESTful webservice, SOAP web service of Jasper can also be used in APEX. And this was mine initial ask ... how to avoid that? Jasper has SOAP web services as well. You can try those. The following guide talks in detail about these webservices.